‘We wanted our wedding to be like a fairytale, with the atmosphere and setting reflecting both our personalities. 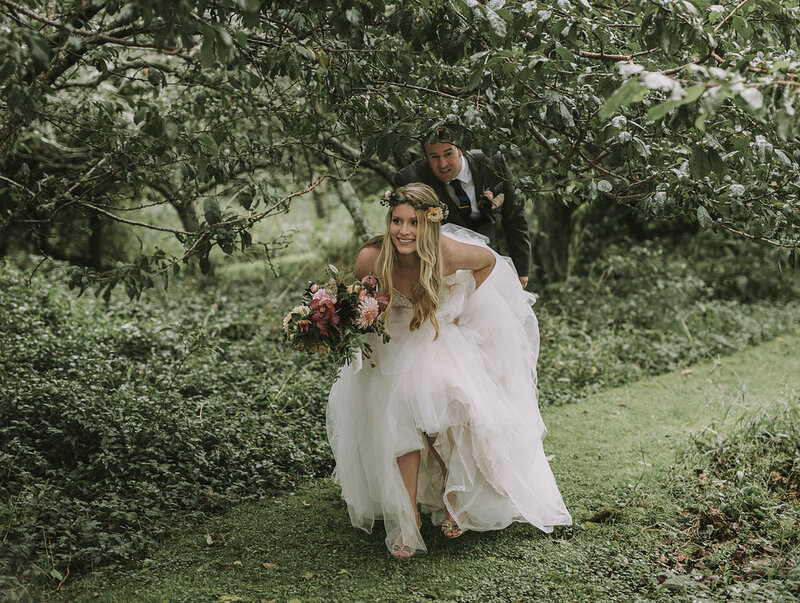 We landed on a rustic, woodland theme and found an incredible venue in the Papamoa Hills that had a sweeping drive, beech-tree woodland, and a rustic barn. In the lead-up to the wedding, I spent most of the year planning and making the decorations with the help of my mum, sister and girlfriends – a task I loved. I wanted the decorations to be relaxed, flowing and organic with a colour scheme of gold, pops of coral, grey and champagne to offset the gorgeous green surrounds of our venue. The floral arrangements were the heroes of our centrepieces, bursting with creeping vines, café au lait dahlias, deep crimson dahlias and blackberries for a wild, handpicked feel. We chose three separate cakes, which looked exquisite, perched on top of huge wooden stumps with naked icing, floral toppers, fruit, and homemade bunting to match our colour scheme. Our wedding day was also Jake’s birthday (it just happened that way!) so we had a gorgeous birthday cake with gold lettering to celebrate. On the wedding day, torrential rain was forecast – my plan was to get married in the woodland clearing before heading down to the barn for our reception. We held out until the last minute for the weather to clear but the skies opened up and we had to race to move the ceremony decorations to the barn. Once I walked into the barn and saw all our closest friends and family lining the aisle, and seeing how love-struck Jake looked, everything else just melted away. It was such an incredible, overwhelming feeling. One of the highlights was my 90-year-old grandma standing to give us her recommendations on what makes a happy marriage. It was so touching and we will always treasure her words.